In this in-depth interdisciplinary study, Jenny Tone-Pah-Hote reveals how Kiowa people drew on the tribe's rich history of expressive culture to assert its identity at a time of profound challenge. Examining traditional forms such as beadwork, metalwork, painting, and dance, Tone-Pah-Hote argues that their creation and exchange were as significant to the expression of Indigenous identity and sover… eignty as formal political engagement and policymaking. 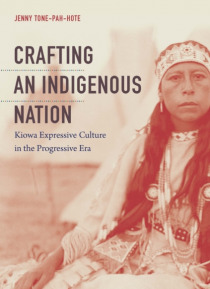 These cultural forms, she argues, were sites of contestation as well as affirmation, as Kiowa people used them to confront external pressures, express national identity, and wrestle with changing gender roles and representations. Combatting a tendency to view Indigenous cultural production primarily in terms of resistance to settler-colonialism, Tone-Pah-Hote expands existing work on Kiowa culture by focusing on acts of creation and material objects that mattered as much for the nation's internal and familial relationships as for relations with those outside the tribe. In the end, she finds that during a time of political struggle and cultural dislocation at the turn of the twentieth century, the community's performative and expressive acts had much to do with the persistence, survival, and adaptation of the Kiowa nation.